Ok not a real Gondola but the best thing after that. Alberto Penzo in his wonderful shop at S Polo 2681 sells amazing Venetians boats reproductions, not the tacky plastic ones you see walking around, we are talking about real gondolas!The Venetian lagoon has a well-established ship-building tradition. Couple that with an intense passion for boat making and you have a stunning collection of gondola model boat kits constantly in production and on sale. Gilberto Penzo, born in Chioggia in 1954 from a family of craftsmen and shipbuilders, lives in Venice where for many years he has been conducting a vast research, gathering and organizing information about traditional Venetian boats. 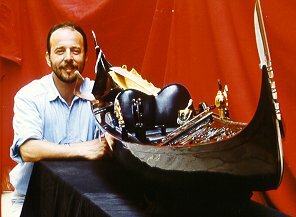 Explanations and direct examples of the last remaining gondola builders (squerariòi), surveys of ancient templates and pattern s, and - in ideal cases - the direct measurement of intact boats, are the sources which allow the author to reconstruct their forms and the construction methods used. These have given rise to a series of books, construction plans, models for museums and private collections, restorations ans reconstructions of boats.With a group of friends who share the same interest, he founded the association Arzanà in 1992 which specializes in the study and conservation of historical Venetian boats.